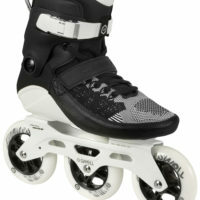 Macroblade 100 3WD M is one of the fastest skates with superior lateral support to release one’s inner racer. 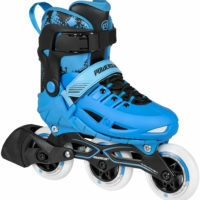 This skate is a great bridge product between the race and recreational skate worlds. It has optimal support, speed, comfort and stability. 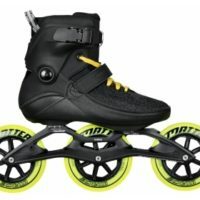 High end components, 3WD frames, high quality engineered mesh uppers and a very secure closure system with speed lacing make this a stylish, great choice for someone serious about skating but does not want a lower profile race boot. Brake is on the skate. 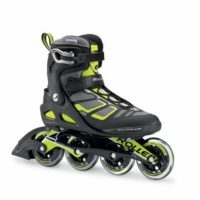 – 3 WHEEL DRIVE (3WD) HIGH PERFORMANCE SKATES for the fitness enthusiast who wants a little more lateral support for stability while looking to train, exercise or skate faster. – FLEX AND LATERAL SUPPORT is ideal in the Macroblade structure. The higher cuff provides extra stability to help with balance & hold the foot securely during the stride. – COMFORTABLE ATHLETIC SHOE ENGINEERED MESH UPPER has padding in the tongue and ankle areas to cushion the feet. Aluminum buckle, power strap and lace lock closure secure the feet with added breathability. – 3WD TWINBLADE ALUMINUM FRAME 274mm/10.8″ is rigid, stable and has a lower profile design for 110mm wheels to lower the center of gravity with increased speed and maneuverability. 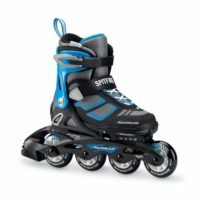 – ROLLERBLADE SUPREME WHEELS 100mm/85A wheels blend speed and control perfectly. 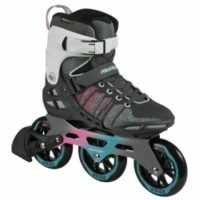 SG9 bearing spin is superior and helps provide the appropriate speed.